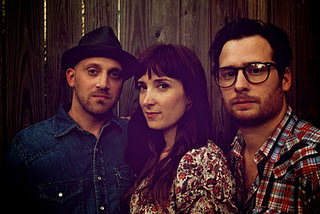 Big news in the world of my musical interests this past weekend was that Alex Dezen of The Damnwells will be joining his sister Cameron Hammon and brother-in-law Matt Hammon to make a trio out of the group The Rebecca West. This is big news for me because Alex has transitioned in to one of my favorite artists because of his writing talent and that soothingly empathetic voice of his. What makes this move most intriguing is that these three artists have been working with each other for quite some time, just not associated with the same band. Alex found success with The Damnwells and Matt joined him as their drummer for a short while. A few of Alex's songs are inspired by his family life and Cameron has been clearly featured in songs like 55 Pictures. Perhaps the most exciting part of this merger is that The Rebecca West is an acoustic group which will benefit greatly by Alex's vocal presence and writing ability. It will be exciting to see him matched up with family and an already talented duo of musicians. To read the official announcement and news about the new direction, read the statement from the band on their Blog Page. If you are new to The Rebecca West, I have a free song download for you to sample. You can stream the song using the widget below and download it by entering your email address. Any comments from the Damnwells fans out there? Lost & Found = good easy listening tune! Thanx for the free dload musicsourced! Just d-loaded Lost& Found! Liked it a lot ! Thanks MusicSourced!